It doesn’t get too cold to run in Arkansas. My high school track and cross country coach reminded us of this on a regular basis when the winter months had athletes grimacing and scrunching up their nose at the thought of running outside in anything below 40 degrees. Now, unlike many of my fellow runners, I had no problem darting out into the brisk wind and chilly temps to put in some miles. For me, the cold only bites for a few minutes before your body heats up and the air is more refreshing than anything else. The weather has finally taken a turn this season, with temps dipping below twenty and the wind carrying an extra chill that makes it feel even colder than it actually is. I used to run out in twenty five degree weather still sporting nothing more than a pair of shorts and a sweatshirt. But college changed me. Living in the seemingly always windy city of Jonesboro might have something to do with it, or maybe I just have a little more sense in my brain. Whatever the case, it only takes a dip below 40 degrees to have me reaching for a long sleeve, tights and a pair gloves. When the weather gets cold many runners look forward to hitting the road or the trails. However, many more dread leaving the warmth of the inside for the unforgiving frosty temps. Some opt to hop on a treadmill rather than face the chilly outdoors. 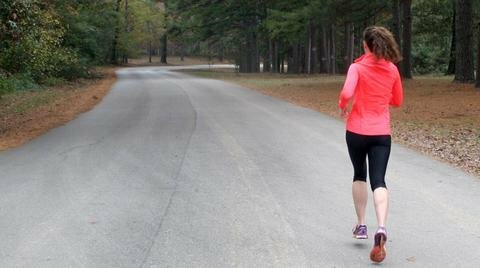 But what I’ve found is that my coach was right; it doesn’t get too cold to run outside in Arkansas, and with the right gear, every runner can brave cold temperatures to get in their miles without stepping foot on the dreaded treadmill. Every runner is different, because everyone’s internal thermometer has a different level for comfortable. But when you find what works for you, it can change your experience of cold weather running. Like I said, I used to be a minimalist. I refused to wear gloves and only donned an ear warmer when the weather was harsh enough to make my ears hurt. And there’s nothing wrong with wearing as little as possible, even in cold weather. But I’ve found that it helps to layer up. When starting up a nine mile run with tights, a long sleeve, a light jacket or sweatshirt, gloves and an ear warmer it’s nice to feel bundled up. There are days when that is excessive, and I end up ditching a layer after a few miles, but it helps to get you started if you feel prepared for intense cold. I’ve also found that the longer you wait it out, the better it gets. So my tips for bundling up when the temps drop? — Wear layers. You can always ditch them as your body heats up and you get warmer. — Wear too much, and give it time. A lot of times I start to get hot and feel like ditching the sweatshirt. But if you wait it out, sometimes your body will compensate and you’ll start to feel normal. You may start cold, then get too hot, and then find the hit the perfect balance without changing your wardrobe. It just takes a little bit. — Wear the gloves. I used to hate them, but I promise, your fingers will thank you. — Wear long socks when it gets especially cold to protect the ankles. — Cover those ears up! Now, you may be just fine in a hat. But lady runners, you might want to opt for an ear warmer so it doesn’t get in the way of that swaying ponytail. Sometimes snow and ice might keep you from stepping outside. The weather in Arkansas is unpredictable and can force you indoors. But if the sun is shining or it’s just overcast, it will not get too cold for a run outdoors here in the South. So layer up and get in those miles!